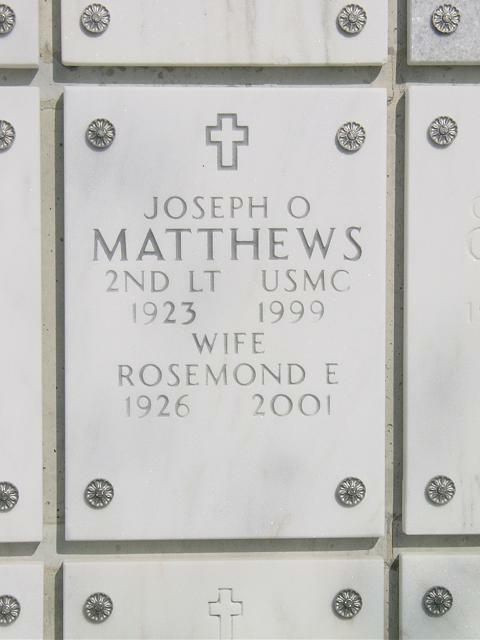 Joseph Olye Matthews, 75, who worked at the Central Intelligence Agency as a liaison officer, editor and analyst, died of cancer February 6, 1999. He lived in Bethesda, Maryland. Mr. Matthews began at the agency in 1950 and was later posted to London. He later was a liaison with British Commonwealth officials in Washington. After he retired, he was in the landscaping business. Matthews was a native of Huntington, West Virginia, and a graduate of Yale University. He served in the Marine Corps in Okinawa during World War II and was awarded a Purple Heart. His marriage to Allison Butler Matthews ended in divorce. Survivors include his wife of nearly 35 years, Rosamond Earle Matthews of Bethesda; three children from his first marriage, Scott L. Matthews of New York, Marna Matthews of Yardley, Pa., and Maeve Matthews of Rochester, N.Y.; and four grandchildren.